The Indian Head hiking trails connect with the Luddams Ford trails forming a long trail showcasing the Indian Head River. 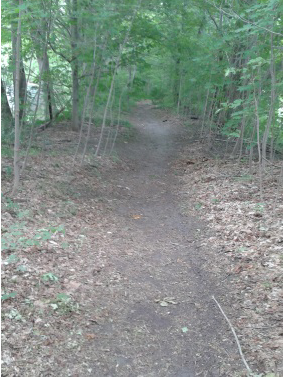 It follows the course of an old railroad bed. The main trail connects with a network of trails that many times bring the hiker above the river on rocky overlooks. 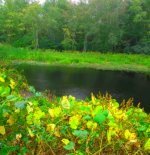 Those who want to use the river for Kayaking, can use this hiking trail to scout out the journey ahead and see what kind of adventure they will be in for. There are several good written river guides out there, but each winter storm brings new trouble spots on the river. Especially those more shallow or narrow areas upstream. This hike will certainly help anyone to find these areas and help with preparation. 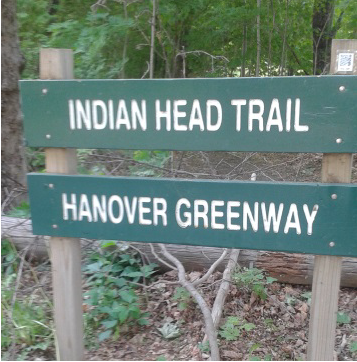 The Indian Head trail head is located near the intersection of Broadway and Cross Sts in Hanover. There are two possible parking spots for hiking this trail in it's length here from the trail head. Across the street on Broadway St is an old fire station now a museum with parking. Around the corner just over the Hanson line on Cross/ State St. is the parking area for Rocky Run Conservation Area. This second option is not marked as such, but an obvious parking spot along the street at the Indian Head River crossing on the street. The other parking option for hiking the full length is at Luddams Ford Park on Elm St. where there is room for many vehicles. 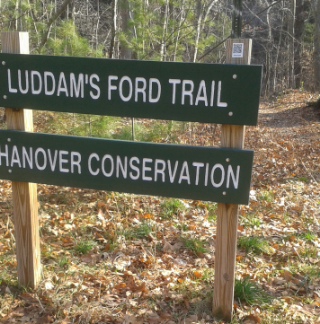 There are additional parking spots on Water St. along the hiking trail's route, and at the beginning of the Luddams Ford Trails sign. The full length of the trail route is marked in green and areas at scenic spots along the river have accompanying trails marked in red. These markings are only on a map which you can access in the trail quick fact section to the right, there are none to be found on the actual trail. 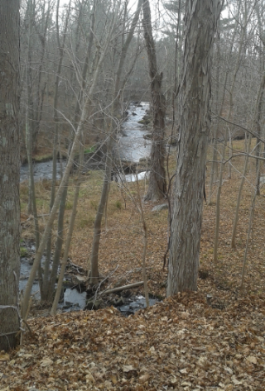 a tributary of the North River to the right of the trail. 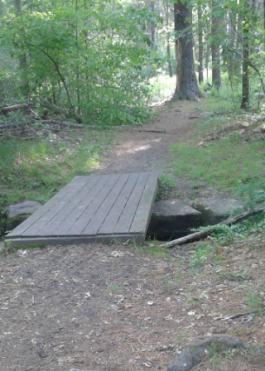 with a culvert allowing it to pass beneath the trail. river to the bridge on Cross St.
Just after, at .13 a couple of faint trails can be found on the right. One leads steeply down to the river and another just after follows to the first rise above the river. 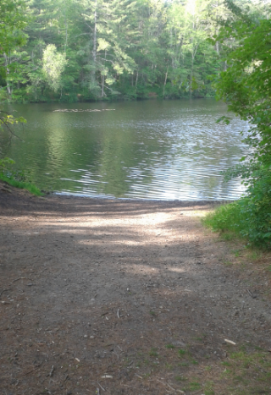 The trail then pulls away from the river a bit. 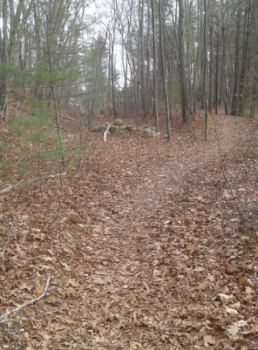 Shortly, at .25 miles a rock pile blocks the way straight, but the trail takes a right here up some raised ground. The journey will now curve to the right and lead downhill, just as the river comes back into view. At .30 miles the accompanying side trails marked in red on the map start to lead off to the right. There will be several of these with large boulders for viewing the river. The sound of rushing water and the chance to take a glimpse at the river will below will draw you down to these vantage points even if you have been here many times before! Part of these trail are connectors that bring you down to the rivers edge but may be engulfed in water at High Tide times. Usually the river this far from the sea is effected by the tide anywhere from 1-2 hours after the listed times for high tide are posted. Damon Point in Marshfield is the area by the sea that the tide chart is figured for this river. 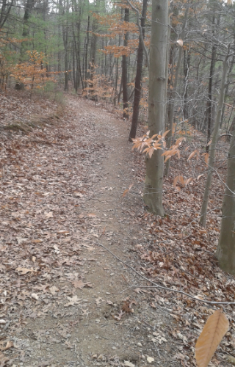 At .44 the trail takes a sharp right downhill. Straight again is blocked and leads to a neighborhood in the area. The trail along the river edge leads out from here, across the river is Rocky Run Conservation in Hanson along an area distinct for its cliff like rock formations. 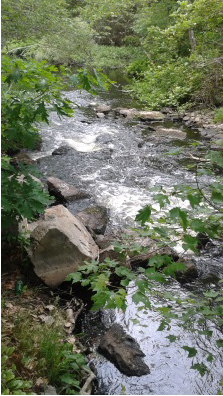 There are a bit of rapids here on the river as well. 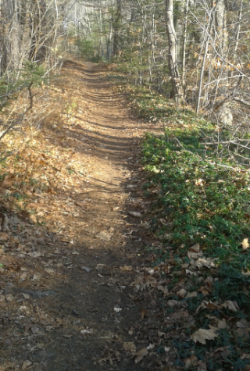 After this area the trail climbs moderately, a good little stretch of the legs! Along the way a trail from the neighborhood sweeps in from the left from higher ground. The trail levels and sits high above the river at this point. Shortly after it levels it then starts descending again, at first moderately then becomes more gradual for a bit then moderate again. Just enough to force you to quicken your step. 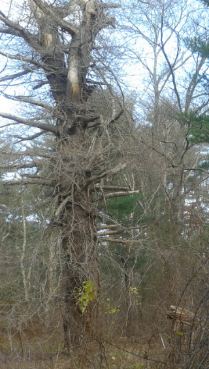 It arrives once again at the Indian Head river's edge, where many trees block the way over the river. At .71 faint trail leads to the right and the trail curves to the left. Shortly after this another trail leads in from the left and the trail pulls away from the river once again. At .85 it turns left and climbs uphill then takes a right. The trail takes on an appearance of leading straight into a garage at a private residence, but just before the property a narrow access trail leads to the left. It winds down, around and up to Water St.
At 1.02 miles the way turns right here and runs along the road to pass by the private residence. Almost a tenth of a mile walk to the next sign leading you back into the forest and on the old railroad bed. The river looks still here as the trail moves straight level and clear. The stillness does not last long and soon at 1.15 we arrive at the old tack factory area. Behind this building a damn had been erected. 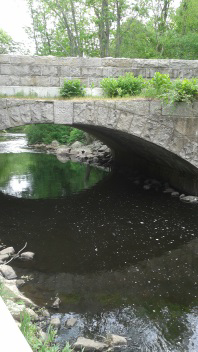 There had been one erected further upstream and called the Cross St dam located at another tack factory operated by Ezra Phillips. In those days these two formed a lake. In 1838 a hurricane destroyed the Cross St dam causing enough of a water surge to damage the dam behind this building as well. Neither were rebuilt, but there are another set of rapids on the river at this location. There is a kiosk with this information and several pictures of the area in those days. In one of the pictures it shows the granite post highway guard rails of which many are still standing today. The trail continues on the other side of the factory where another kiosk with more pictures can be found. The way starts with a lush carpet of creeping myrtle. A welcoming touch of greenery in all seasons! Across the river is the furthest point of Tucker Preserve. At 1.27 the trail runs through an area referred to as the hobo rest. 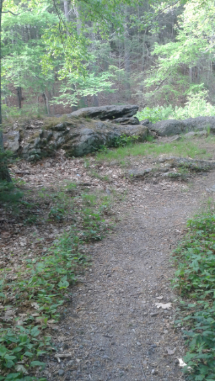 There are a series of small cliff like rocks to the left of the trail. 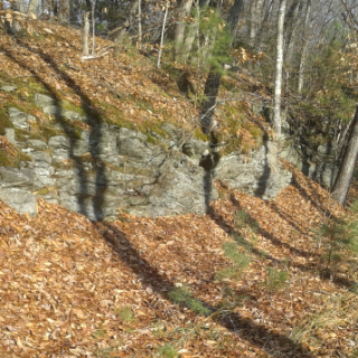 Perhaps they rested here waiting for the next train to hop and these cliff like rock ledges gave them the elevation to easily hop into an open car. At 1 1/2 miles the Luddam Ford Trails start to appear to the right. It is a bit confusing here as signage on the road lead me to believe the main trail is now called Luddam's Ford Trail from here. 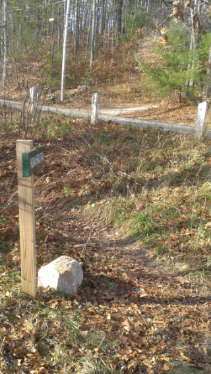 It is announcing the way into the network of hiking trails at the Luddams Ford Park. 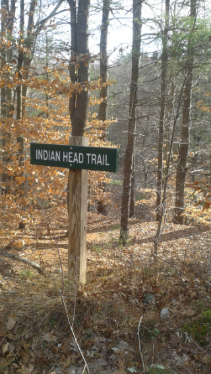 From the park, the main trail is marked Indian Head Trail. 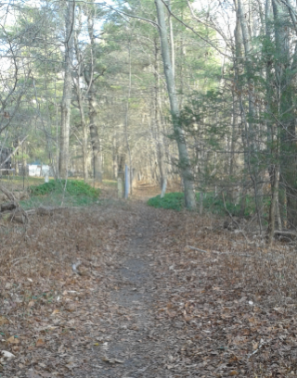 Shortly after, the trail to the right that leads into the Luddams Ford Trails. The Indian Head Trail will now lead through a couple of granite posts and private property fencing lines the trail to the left. It causes the way to narrow here. 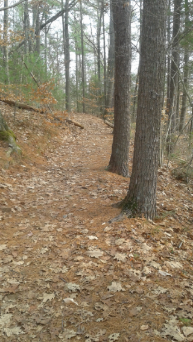 It then splits in two with a narrow lower ground trail to the left and a higher ground one to the right. The hiking trail then passes behind some residences, one with a very friendly horse who may come to greet you as you pass by. Soon the trail will turn a bit left and pass by a very old large tree. Very interesting sight! The way is narrow and away from the river here. Soon the trail will pass another old tree and a single granite post. It then runs through an area where the forest to the right looks partially cleared and a low stone wall follows along the trail side. The trail then runs through a small utility line, if you have visited Tucker Preserve you know this same line runs over one of its trails as well. 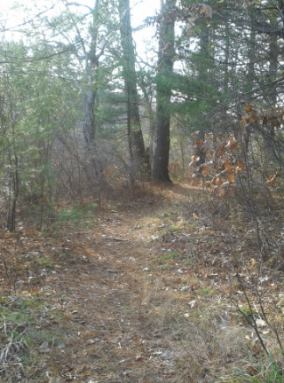 The forest becomes thick on the right again now and a bit of a wetland appears on the left. Now Luddam"s Ford Park and the rest of its trails open up on the right. Pass over a small bridge over a stream coming in from the wetland and into the Park. The hiking trail is 1.80 miles straight through, but with so many interesting areas along the way, the hike easily passes 2 miles. If hiking a full 4 miles is a bit too much, find a hiking partner and park their car at Luddams Ford Park. Parking on Water St is another good option. There are many overlook areas in both directions. 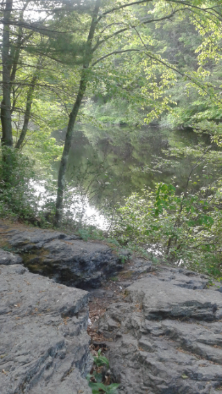 Luddam's Ford Park provides many areas to stop and take a rest. 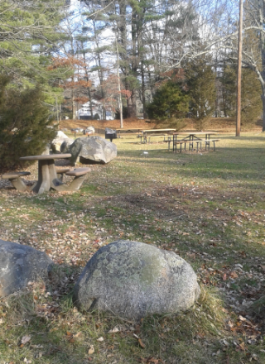 Benches and picnic tables abound here. Plenty of areas to launch a boat or fish from. becoming West Elm once in Pembroke. 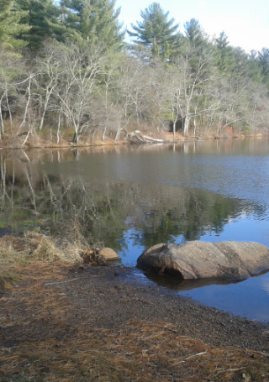 you to many other scenic areas on the pond and river. a bit more secluded and away from the general park traffic. 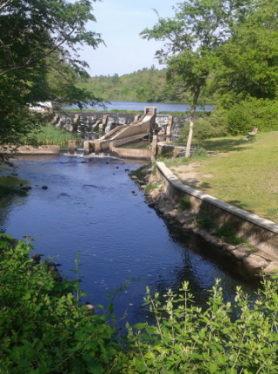 A street view of the dam that creates the pond, it's fish ladder and the Indian Head River continuing on. from route 3 exit 12, follow route 139 west til taking a right and continuing west at the intersection with route 53. At the next set of lights after this turn, take a left on Broadway and another left shortly on Elm St. The park is approx. 3/4 mile on the right, just after Water St. Follow same directions as above but continue straight on Broadway. Approx. 1 mile down on left will be Water St. Shortly after this intersect on Broadway, the old fire station will be on the right. After parking continue walking down the street to the trail across the street. continue on to the intersection at Cross St taking a left. Right after the turn is a small street side parking lot on the left.